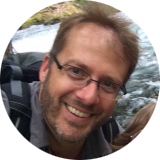 Travel Tips & Hostelling – Tour Guide Mark – Let's Go Exploring! 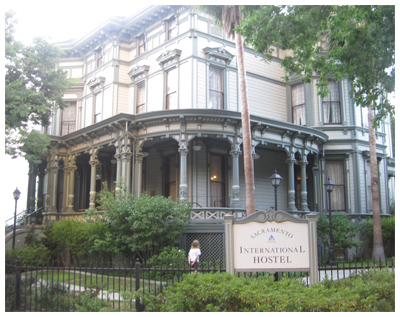 If you want to overnight in a restored Victorian mansion dating to 1885, the Sacramento Hostel is the place. The hostel has worked hard to give visitors a comfortable experience while maintaining the elegance and beauty of this historic building. The family room we stayed in was very spacious. The kitchen was well stocked with cooking utensils and the facilities were well maintained. My daughter enjoyed exploring the stairs and quickly discovered a foosball table and travel library in the basement. The small breakfast that was offered in the morning was a good way to start the morning. The staff members are very helpful in recommending local places to visit and an activity board listing local attractions and schedules is displayed in the main hallway. The building itself has a long history and was once nearly destroyed to make room for a modern skyscraper. Fortunately, the building was preserved, actually moved several times over its history, to become a unique experience for today’s travelers. Look for a pamphlet on the building’s full story that is located in one of the Victorian style living parlors. Parking is available on the street, or in a gated area for a small fee. The hostel is located in the heart of downtown and is a good location for exploring Sutter’s Fort and the Railroad Museum. After a long day of exploring the beaches, forests, and grasslands of Point Reyes National Seashore, where does a family stay? In the heart of this 70,000-acre parkland, is the Point Reyes Hostel. The main hostel is located in a converted ranch house, but recently there is a new addition, the “green building.” The green building was constructed to LEED Silver standards so it maximizes water savings, is energy efficient and constructed with materials that support human and environmental health. I found the new facilities to be clean, roomy and most of all quiet. Our family room had two bunk beds and a larger twin bed on the lower level, but what everyone liked most was the window, which could be opened to allow copious amounts of fresh coastal air inside. The communal kitchen was well stocked with cooking items and the shared bath facilities were well maintained. Adjacent to the kitchen area is a sizable balcony for sitting outside and having a meal. If you sit outside the entertainment can include a covey of quail running below, or even a deer munching some grass nearby. Depending on the time of year you can expect sun or rain, but there is always some amount of overcast that rolls in from the ocean. The seashore is located about an hour north of San Francisco, California. If your family is visiting San Francisco, California, consider overnighting on a decommissioned military base. 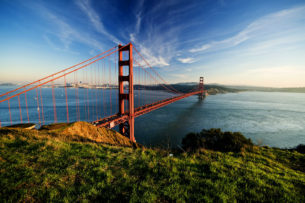 The base is now part of an immense national recreation area known as the Marin Headlands where visitors can enjoy hiking, biking, and beachcombing. 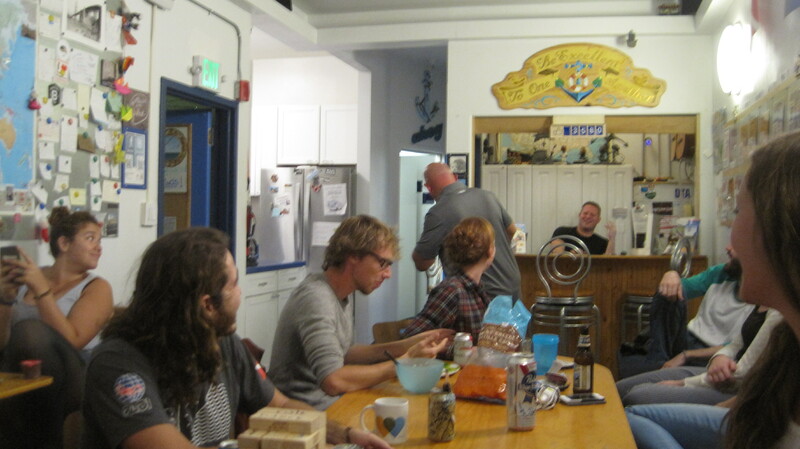 After a long day, when it is time to bed down, the Marin Headlands Hostel is a good choice for families. The hostel has taken great care to restore these historic military buildings, which date to 1907. Families who stay here get a treat, the opportunity to stay in a solidly built two-story building that served as Officer’s quarters. Inside the house an impressive staircase greets visitors and a cozy living room is stocked with books and games. A broad porch welcomes parents who wish to sit, rest, and watch sunsets or catch glimpses of deer grazing in a field. As part of the hosteling experience be prepared to bring your own food and make use of the common kitchen. 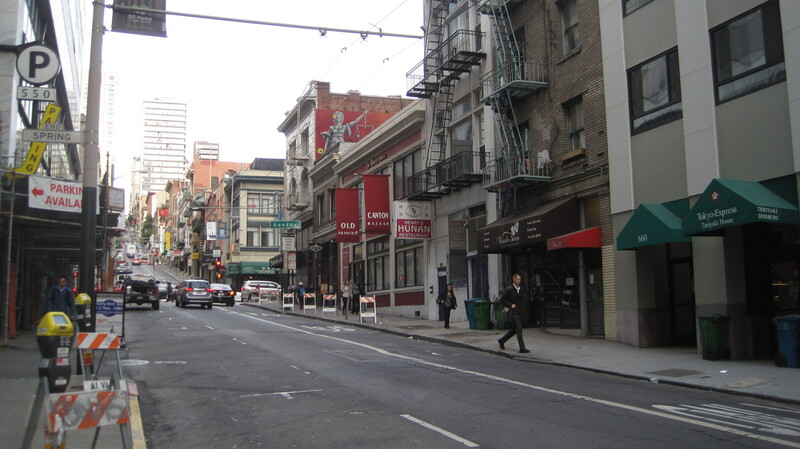 The hostel is a good value for the money, especially considering the high cost of accommodation in the bay area. I would suggest earplugs to guard against any possible late night noise. What I found most memorable during my stay was hearing an owl hooting in the stillness of the night in this immense and open green space of the Marin Headlands, and knowing that just a few miles away, live several million people. Sometimes when you travel a place just catches your eye – you want to see more of it. 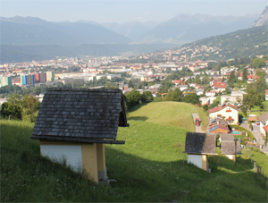 A small church named Kalvarienberg that overlooks Arzl and the city of Innsbruck, Austria, caught my eye fifteen years ago. It was a tiny, white building perched atop a small hill. For some reason this hill just beckoned to me – I had to visit. During that first trip more than fourteen years earlier, I never got to see it up close, even after visiting Innsbruck multiple times the opportunity slipped away….until recently. 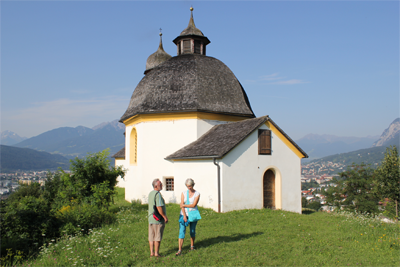 The church is about a forty-five minutes walk from the Youth Hostel in Innsbruck. Wear some comfortable walking shoes as the ascent is greater than it first appears. 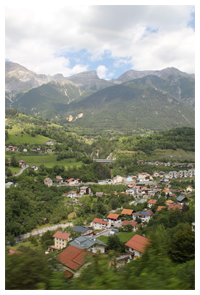 Part of the enjoyment of the walk is you get to explore the small town of Arzl, which is quiet and relaxing. Arriving at the base of the hill where the church stands you will pass several shrines along the worn footpath. The area is covered with green grass and sheep are grazing in a fenced area on one side of the hill. Reaching the top allows for fantastic views of the city and mountains beyond. The church is old, has a white exterior and is smaller than I expected, but uniquely designed for the small hill; it does not detract from the natural beauty of the area, rather the hill is beautified by this structure. Artifacts from Roman times and even stone age peoples have been found on this hill. It was easy to see why this is a great location to defend and to see who might be coming down or up the river. But, today this hill offered peaceful personal reflection and a platform for drinking in intoxicating views of the majestic Inn Valley. Bring a snack and some water for the hike, or even a small picnic to enjoy at the top. I returned from the hill and back to my starting point, I looked back. The church quietly stood on the hill as it had before my visit. When traveling in Europe ask the locals about farms that serve meals. It is a great way to eat fresh food, discover someplace new and experience the countryside. 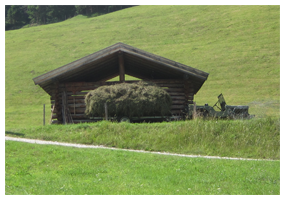 During a trip to Tirol, Austria, we found a farm that served breakfast. There are many such farms in the Alps but this particular one was in the village of Mühlau, a district of Innsbruck, Austria. Breakfast is offered to the public on select Saturday mornings, and the locals suggested we arrive – earlier the better – as it was a very popular location. We managed to catch a ride that morning. As the car drove quickly through the narrow streets of Mühlau not many people were out. Many of the houses had yards and bright and bountiful looking gardens. Several farms were in the area, but they integrated well with the houses and with other buildings in the town. A large green space weaved its way into the town and it was hard to tell where the town ended and the farms and green space began. We arrived outside a small green yard with a sturdy looking house and several large wooden barns. Attached to the house was a newer section made of wood and glass. We entered through a heavy wooden door that swung inward, the inside building was made of a light colored wood with windows near the ceiling which allowed in an abundance of natural light. The room was clean and basic in design. A crucifix hung on one wall. Inside the room were nine or ten long tables, each with accompanying wooden benches at the sides. At these tables were maybe 80 people eating with a plate of food. The breakfast assortment included traditional items: homemade fresh bread, freshly made jam, slices of thin meat, speck, yogurt, cheese, fresh milk, some fruit, hard boiled eggs and cups of coffee. A small line of folks was standing in front of a serving table that included baskets and serving plates. The line was held up because a basket of some critical food item was out. At that moment a woman emerged from a recessed back room, scurried over and refilled the basket of bread. Then another person, this time a child, ran over with clean mugs to refill the inventory, then another child walked over with a plate of cheeses. Then an older woman came out, this was the Mom; she straightened a few things, looked around and instructed the kids to work on some other items. The atmosphere in the dining hall was relaxed and the people eating were content. Almost everyone there was locals. A small sign with the letters ‘wc’ (water closet) hung on a large, carved wooden door. Opening the door you walked through a storage area that included a variety of farm implements and boxes of dried food, there was an inside door that opened into the family’s house! There was a hand-scrawled sign on the wall, that looked like a child hurriedly wrote it, with the letters ‘wc’ and an arrow. The arrow pointed to a small guest bathroom. I could hear a TV in one room and people talking from another room. It was an odd feeling just walking into someone’s house. I was surprised that so many guests visited this house, yet the facilities remained very clean; it was also surprising that the family allowed strangers into where they lived. Everyone visiting the small, local farm was courteous and treated the place and each other with respect. It was a refreshing experience. When we finished our breakfast we found the farm Mom and paid for our meals. The cost was €7.50 (about $10) person. She invited us to look around outside. The big barn was inhabited by 4 large brown cows and nearby we heard chickens, but they were cooped up because of all the visitors. We looked for horses, but a sign said they were up on the mountain. The kids who were visiting the farm enjoyed petting some bunnies and guinea pigs. It was great being in the city and enjoying some good fresh and locally produced food. 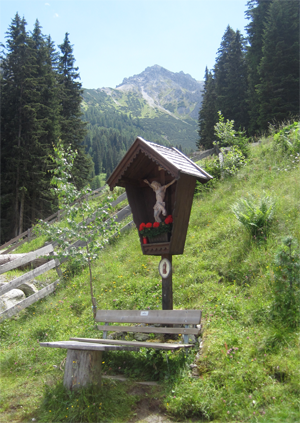 Religious shrines are abundant in the mountains, cultivated valleys, and forests of Tirol, Austria. The observant visitor will see them everywhere: at the edge of roads, on city streets, in the woods, at restaurants, in businesses, outside of cafes, and even on remote hiking trails. Many of the smaller shrines are carved from wood, are raised off the ground, and sit at eye level. They can even be displayed on a tree. Inside these shrines, protected from direct wind and rain, can be paintings or photos of revered figures: the Madonna, Jesus, Saints or even loved ones. Some shrines are large and placed in prominent places like sidewalks; while others are small and in out-of-the-way places. 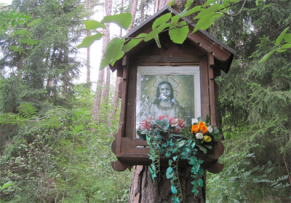 One of the smallest shrines I saw rested about 4 meters (12 feet) up a cliff, directly overhead, on a hiking trail. I would not have seen it if I had not stopped for a drink of water and happened to glance up. Other shrines are made of stone or cement; they can be the size of a small car or that of a small bus. These shrines generally have a gate or a fence outside while inside are paintings or statues. Frequently I saw flowers, candles, and photos of people resting just inside such shrines. In family-owned cafes or in people’s houses a small shrine might be found, but usually, the most common symbol to be seen is a large, ornately carved wooden Crucifix hanging in a corner or along the wall. If you travel to the top of a mountain a large cross will be located at the highest point. A walk through a thick forest can even reveal a small shrine. Every town has a church. 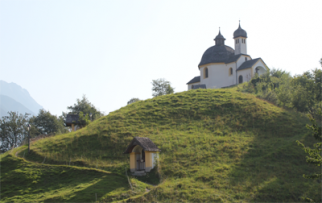 These Alpine churches are often graced by the well-known tall rectangular spires that symbolize the Alps. Larger towns might have a basilica and in some cases cathedrals. 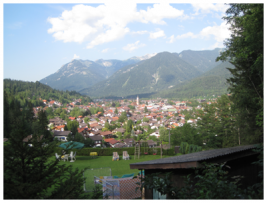 Tirol is sometimes referred to as the “Holy Land Tirol” by residents. 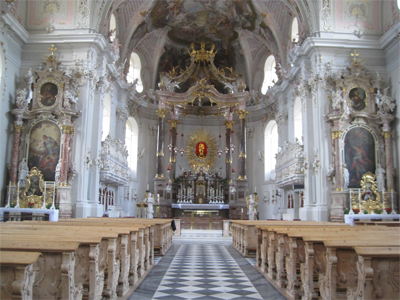 The great majority of Tirol’s populace are Roman Catholic. 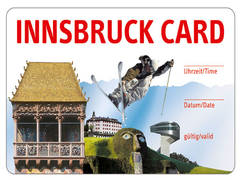 Visitors to Innsbruck, Austria, can keep some cash in their wallet by using the Innsbruck Card. The Innsbruck Card is like a ‘golden ticket’ for the holder and provides free entrance to the beautiful sights and historic museums in the Innsbruck area; a ride up and down on one of 7 lifts and free transportation on public transit lines. The card is valid for either, 24, 48, or 72 hours, depending on what you purchase. The price (at the time of this writing) per adult is €29 for 24 hours; €34 for 48 hours; and €39 for 72 hours. The kid’s price is half the adult amount. This might sound a lot of money, but museum entrance and bus transit fees start adding up and can wreck a budget. I found the card to be a great investment. The card allowed me to see some amazing stuff, it easily paid for itself in a day and personally saved me $80 in entrance fees over three days! If you have the time and budget I would recommend the 72-hour card; it provides the most flexibility to accommodate weather, crowds, and Monday. Museums are generally open 6 days a week, but Monday is the day that museums in Innsbruck are closed, so plan around this day accordingly. 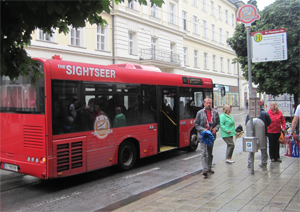 The city has an exceptional transit system, but you should consider using the Sightseer Bus with your Innsbruck Card. This big red bus makes stops at all the major museums and runs every fifteen to twenty minutes, it is a very fast and direct way to get around, and of course, free with your Innsbruck card. 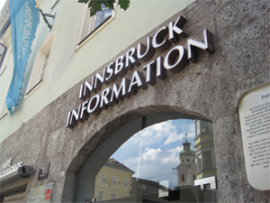 The Innsbruck card can be purchased at the ‘Tourist Information’ center downtown which is located at the border of Altstadt and the Maria-Theresien-Straβe (street). The desk staff is multi-lingual and very informative. I suggest you go early in the day to avoid the tour-bus crowds. Maximize your experience by knowing the places you want to visit before you buy the card. When you purchase the card you will be asked about the 24-48-72 timeframe and an important question, “What time do you want the card to start?” Be careful, do NOT say “now” and then leave to enjoy a coffee. When you purchase the card a chip embedded in the card is activated. At the end of the 24, 48 or 72 hour time period the card will be invalid. I made good use of the card for 72 hours but was four minutes late arriving at one museum. I attempted to use the card when it was 72 hours and 4 minutes old, but only found it was no longer active. All cards come with a brochure that lists all of the museums and sights, includes a map and shows the route of the Sightseer Bus. Years ago during a visit to Innsbruck, Austria, I had the pleasure of riding a quaint and antiquated one-hundred-year-old funicular railway, called the Hungerburgbahn. 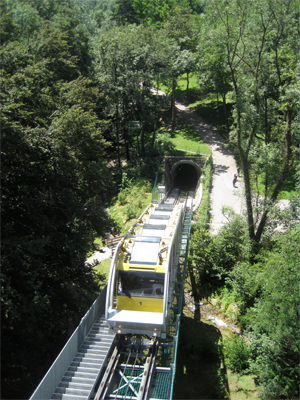 A funicular railway is designed to climb steep slopes. The old Hungerburgbahn (shown in a photo from the early 1900’s) squeaked, clicked and creaked up the mountain making the ride an adventure in itself. 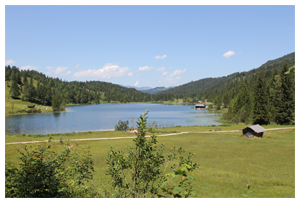 The route was a simple straight track that traversed over a bridge spanning the Inn river, then up the mountainside, past the Alpenzoo and beyond to the Hungerburg cable car station. The track was less than one kilometer in length but riding it was like stepping back in time. Sadly, this funicular railway was closed in 2005. It was replaced in 2007 with a modern, safer and more expedient railway. The new Hungerburgbahn is stepping forward in time. A futuristic building with rounded and sweeping architecture identifies the Congress station to riders. This underground station is close to Altstadt (Old Town) Innsbruck, the center of shopping and tourism. At the station, quiet escalators move passengers below ground to a small waiting area where a polished and modern tram car glides quietly to the boarding area. The doors whisper open and people board. The doors close with computerized efficiency and the tram hums away down a dark tunnel. With a sudden flash the tram bursts into the daylight, making a quick stop at the Löwenhaus station then crosses an architecturally stylish bridge over the River Inn – treating riders to a postcard view. The train disappears into another tunnel and begins a steep ascent up the mountain. Individual pods on the tram change their angle, keeping the riders comfortably level, but this action is so silent, so normal that people do not observe that any change in the angle has occurred. Now the tram re-emerges into the light, the Alpenzoo station is just ahead. To the passengers, the sights and buildings of Innsbruck begin to appear in miniature as the tram climbs higher. A stop is made at the Alpenzoo and then just beyond is the terminus of our ride at the Hungerburg station. From this station, passengers can explore the countryside or catch a gondola to explore the top of the mountain. The Hungerburgbahn travels less than 2 kilometers and climbs 288 meters in elevation in just a few minutes. 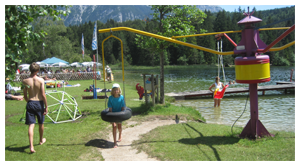 Visitors to Innsbruck will appreciate the close to the downtown station and the fast travel time up the mountain – especially if you are traveling with kids or the weather is a concern. Whether you are visiting family members, on a tour, or independently exploring Tirol in Austria, you will ultimately find yourself eating at a restaurant or cafe. Here are four tips to help you have a more enjoyable meal. In the U.S. a glass of drinking water (tap water) is always served in a restaurant and is complimentary with the meal. It is OK to have just water, and not any order social drinks, with a meal. Mineral water can appear on a menu, but is sometimes considered extravagant. In Austria and much of Europe, a glass of (tap) water is not a complimentary item. Asking for just tap water, and not ordering social drinks, is considered rude and cheap. Water can be ordered but what you will receive will be mineral water. The waiter will ask, “Do you want Stilles Wasser or Prickelndes Wasser?” Prickelnd means with bubbles, the water is carbonated; Stilles Wasser means no bubbles, just mineral water. The waiter will then bring a small bottle of mineral water to you. If you want regular tap water, you can ask for it, but request it AFTER the other drinks have been ordered or when your meal is delivered to the table. Requesting water in this way will save any locals at your table any social discomfort or embarrassment. The prices listed on menus have the tax included. A dinner that is advertised at €15.00 will cost you €15.00. Tipping will be extra. In the U.S. a waiter often earns a base pay (sometimes under minimum wage) and makes up the difference in pay through tips. In the EU, a waiter, as an employee is already covered by a handsome benefits package and has state-run health care. So, tipping in Austria has different rules than it does in the U.S. I checked with natives of Innsbruck to ask how they tip. Their general rule is: if you order drinks, tip up to the next Euro. If you order food, tip several Euros. So when drinks cost €6.20 you might pay €7 which includes the tip; if dinner costs €25.40 you might pay €28.00 which also includes the tip. Be careful of touristy restaurants (a place that talks to you in good English and gives you a menu in American English) because they sometimes play to the American custom of tipping at 15% – 20% and will even print this request in the English worded menu. In the end, wherever you eat, if you receive excellent service tip what you wish. In America, a bill is placed on your table near the end of your meal. In Austria, you must ask for the bill. This custom does allow you to stay at the table and talk sometimes for hours. When you are ready to pay, identify yourself to the waiter and ask for the bill. In smaller restaurants, the owner will approach with a small change purse and a copy of the bill. The owner will show you the bill and say the total amount. You reply with the amount you will pay, (following the tipping rule). Any change will be returned. 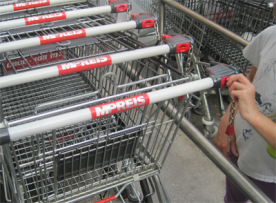 Grocery shopping in Austria is one of the best ways to learn the German language and discover this great culture. First-time shoppers from America will see many similarities in the grocery stores, but there are some differences. Here are some tips to better enjoy grocery shopping. In the U.S., bags are often included as a ‘courtesy’ item when you shop. In Austria, the stores expect you to come prepared with your bags. The locals generally use cloth mesh or fabric bags that are lightweight. If you do not have a bag the store will be happy to sell you one, for a small fee. Most of the paper bags I saw for purchase were 20 cents. If you are traveling and don’t have a bag you can use a daypack. The store does not mind what you use for bagging as long as you quickly make room for the next customer. 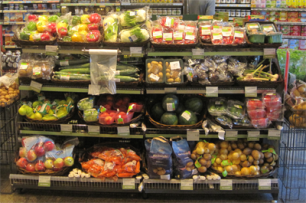 At most U.S. stores you take the fruits and vegetables to checkout and the checker (from memory) enters a code into the register while the items are weighed. In Austria, you might need to approach a scale, weigh the food, and type in an item code. A sticker emerges from the scale and you attach it to the item or bag. Some pre-packed veggies are already weighed and marked. Be observant, don’t just grab some veggies and rush to the checkout, take a second to look to see if it needs to be weighed or it is already marked. In the U.S. the checkout person will scan/weigh the food and send it down a small chute where the food queues up and, if we’re lucky, a store employee bags the groceries. In Austria, you or another person in your group needs to be ready to bag the food immediately after it has been rung up. There is generally little space for food to queue and in some cases no area at all – as in a drop-off. If you are slow with this process and food backs up, you might earn a wrathful look from the checkout person or others in line. Best to be ready to bag. I have seen in a few places in the U.S. where grocery carts are rented using a quarter or a dollar coin as a deposit, but it really has not caught on in the States. However, in Austria, and much of Europe, use of coins are commonplace. When you approach a grocery store you will see the shopping carts are locked together. Have a 50 cent coin or a 1 Euro coin in your pocket. Insert it into a coin area on the cart’s handle and unchain the cart. At the end of shopping, return the cart, re-chain it, and your deposit money is returned. In Austria, the food is taxed, but the tax is included in the final price. If something costs you 1 Euro, you do not have to pay additional. As a traveler I find this helpful with budgeting my daily expenses; I do not have to consider an additional 7% -10% on top of the final price. I found this to be the case with many food items in restaurants as well, taxes were included in the price. Farmers markets are alive and well, but you might need to look for them. Innsbruck has a downtown farmers market and on Saturday such markets can be found on certain corners. The corner market near me in Innsbruck is small, with just a few farmers selling items, but they have the standards: fresh greens, fresh bread, some meat products, and honey. Some items are high in price, but the in-season veggies and bread are more reasonable. If you are uncomfortable speaking German try to visit stores at down times when they are not packed with customers. The staff is more open to helping you find things and are more willing to speak. You might have several conversations in broken English/German with the store staff but it is always good fun. In the U.S. there is usually some store in town that is open 24 hours, 7 days a week. 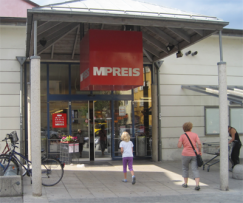 In Austria, the stores have more standard hours (like 9 am to 6 pm) and might be closed on Sunday. Plan ahead and take note of when your local store is open to make sure you have the food items you need. 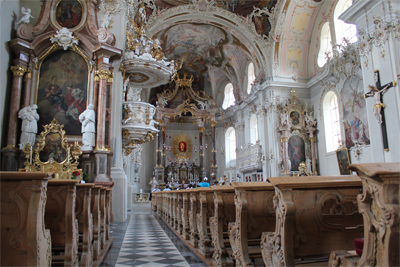 A visitor to Innsbruck, Austria, will see many beautiful churches and shrines. Each place of worship has a unique story sometimes hundreds of years in the making. The Basilica in the Wilten neighborhood of Innsbruck has a great story and is one of the most beautiful structures in the entire city. A long time ago, as the story goes, a giant named Haymon came to the great Inn valley in the Tirol. Here he saw the people of the valley being harassed by a dragon. He did not like this so he crafted weapons to fight the dragon; it was a terrible battle, but Haymon prevailed. This victory did not sit well with another giant, named Tyrsus, who also lived in the area. He considered Haymon his rival. The rivalry eventually turned to blows and in the commotion, Haymon stabbed Tyrsus – who died. Haymon was overcome with grief! He sought atonement and out of his grief founded a monastery at Wilten. Haymon continued to be a monk at the monastery for the remainder of his life. Today, the monastery still exits and is adjacent to the beautiful Wilten Basilica. Visitors to the Basilica will be impressed by the beauty; the soft and gentle colors, the abundant light, hand-carved wooden pews – it is a place you just enjoy. The Basilica is centuries old, the oldest part being the chalice which dates from 1160. First, there are the great wooden doors that a person enters – they are massive, yet well balanced and open with a firm push. The main hall has lofty ceilings and walls that are painted with biblical scenes. After entering the Basilica and admiring it, walk to the center and look back; over the front door is a massive and towering pipe organ which, despite its size, blends well into the surroundings. On this day the Basilica is quiet. Some people are sitting in pews praying, reflecting on life itself, or just sitting quietly enjoying the ‘presence’ of this place. A person who had been sitting quietly stands and takes a step – it is heard all the way to the back of the Basilica. The person looks around the church for a second then walks up to the center aisle and exits the Basilica. Near the front door are some candles, many are lit to remember relatives and friends. To the side is a photo hung on the wall, it is Pope John Paul II during his visit to the Basilica in 1988. My wife and I have been here before, many years earlier; the Basilica has not changed and there is comfort in that. The stillness and near absolute quiet of this place is most audible. Suddenly, a loud and heavy ‘pop’ is heard as the main door is quickly opened and a group from a tour bus pours inside. The sound echoes through the place. The tourists try to be quiet but are difficult for 40 people who are amazed by the beauty in this place. The tour guide walks to the front and, as quietly and respectfully as she can, points out the various features of the church. The group appears to be from Spain, but they look like a group of retired Americans from Florida – sunglasses, wide-brimmed sun hats, shorts, tennis shoes, and cameras mounted firmly to their bellies. Many of the tourists stop at a table and buy postcards, books, and other items. The leave. A few stragglers stay behind a minute or two and capture some of the returning calm and silence then they hustle outside to catch up with their group. It is quiet again and enjoyable. Another tour bus pulls up outside, shortly followed by another. Experiencing a thunderstorm in the Austrian Alps is a mixture of angst and awe. One such storm was witnessed in the beautiful Alpine city of Innsbruck, Austria. The morning was warm and muggy with just a few innocent puffy clouds lounging overhead. Throughout the day a haze of moisture slowly grew on the skyline. Beyond, in the western part of the Inn valley, menacing looking clouds slowly matured. As the sun lowered in the sky the stillness of the day was replaced with a breeze. The breeze quickly became stronger and was punctuated with stiff gusts of wind that pushed against trees and buildings. Lightning appeared in the distance over the mountains. The storm was approaching. The lightning would rip down to the ground; the effect would envelop the entire sky with a blaze of light and simultaneously create outlines of two or three giant Alpine peaks. Many kilometers away it was obvious that a huge amount of energy had just been released. A few moments later a deep rumbling roar of thunder could be heard. The storm seemed to race down the ancient Inn valley and approached Innsbruck. The lightning came closer and the wind grew in intensity. Drops of spat rain quickly became a sidewise wall of water forcing most of the onlookers inside. Gusts were so intense that objects on outside porches were blown over. The heart of the storm was close. Lightning cascaded high in the clouds and illuminated the sky directly over the city. Mountainsides only several kilometers away were punched by great bolts of electricity – immediately followed by a loud boom. The lightning, at times, seemed to appear, disappear for a half-second, and then reappear in the same path as the first. The intensity of the storm subsided as the lighting moved eastward. The thunder continued but this too diminished. Soon only the steady and peaceful beat of the rain was heard. 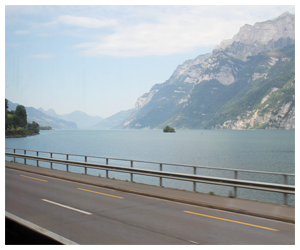 A beautiful train ride is from Zürich, Switzerland to Innsbruck, Austria. This three and a half hour trip treats riders to comfortably sit and gaze from large windows onto blue inland lakes, green pastures, and picturesque mountain passes all set among the backdrop of the grand European Alps. 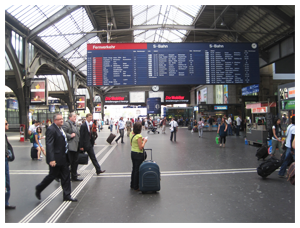 Our trip began at the enormous Zürich Hauptbahnhof (Zurich’s main train station). We had arrived at the main station on a local train and several levels below ground. The escalator brought us to ground level where a number of trains were queued to leave for their respective destinations. A large train schedule board overhead flipped to life every few minutes to update the departure times. The station was enormous and busy but well maintained and clean. A flurry of people passed; some briskly walked to work, others sprinted by with shopping bags, some people lugged backpacks. Vendors at stalls sold everything from sandwiches to cigarettes. We found our ride at track #3 and boarded. The train was immaculate and spacious, which at first seemed curious since we were in the economy section. We found a moderately empty passenger car, stowed our backpacks and sat down at a table. A digital display over the seat stated our seats were reserved at Salzburg but that was long after we were to depart. The WC (bathroom) was very clean, well stocked with supplies and roomy. An attached Bistro car sold beer and sandwiches. Exactly at 10:40 A.M. the train left the station. For the entire trip, the passenger car gently rocked. There was little if no noise from the tracks. The passengers on the left of the train enjoyed great views of the Zürichsee, an inland lake that stretches roughly 40 km in length. The shallow waters were blue and emerald and people were seen swimming in several areas. Sailboats were occasionally berthed just offshore. 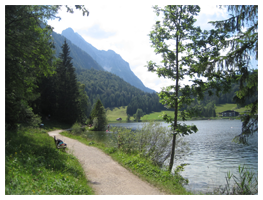 The giant lake ended and soon was replaced by a smaller but equally beautiful Walensee. Here large gray mountains plunged into the steely blue waters. After twenty minutes or so the lake transitioned to gentle fields of green were fat mountain cows grazed. At the Buchs Station, the train stopped and a small number of people transferred. Several lightly armed border police did a walkthrough of the cars. The train departed and within minutes passed over an emerald mountain river, this was the Rhine, one of Europe’s major rivers. The waters of the Rhine would ultimately empty in the north Atlantic Ocean. At this location, the Rhine marked the border between Switzerland and the small country of Lichtenstein. As we crossed over the river we saw lots of trees but soon there were houses and businesses, this soon gave away to green lush woods. After 6 km (roughly 4 miles) or so we quietly passed into Austria. A few kilometers into Austria the train stopped at Bludenz and the border police we had seen earlier departed the train. From here the train moved further into Austria and climbed higher in elevation. The streams cascaded down the sides of mountains and the valleys became very steep; the train soon left the valley floor and snaked along the edge of the steep and forested mountain. Occasionally the trees would open and flood the car with light and astounding views of the valley below. The train disappeared into a tunnel and for the next five or so minutes only darkness could be seen outside our well-lighted passenger cars. The water in a bottle sitting on the table in front of me slowly changed from being slightly angled down at the front of my bottle to that of the back and suggested the train’s ascent had now become decent. We had just passed under the continental divide of Europe! From here all of the streams and rivers would flow to the Mediterranean. Shortly after exiting the tunnel the small trickles of water now tumbled in a different direction. Snow still dotted the high peaks. The train raced down the mountainside and the scenery whizzed past. Here the road and the tracks seemed to dance down the valley sometimes sharing the same side of the river. The barren high peaks turned into forests and the small waters of the neighboring stream became the mighty Inn River, another major river of Europe. Mountains still bordered both sides of the valley and large green pastures opened up as the valley became wider and more gentle. The valley itself was flanked by peaks that towered 2,427 meters (7400+ feet) overhead. In the distance was Innsbruck. 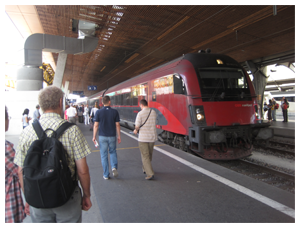 We gathered our belongings as the train pulled into the Innsbruck Hauptbahnhof. We stepped off the train into the historic and beautiful city. The train is more affordable if you can reserve ahead of time. If you purchase tickets at the Bahnhoff the day of travel the price can double, costing 75 Swiss Franks (or $100 US Dollars). Make reservations online if possible. The trip was from Zürich to Innsbruck was 284 km (176 miles) with only 7 stops. It is a very fast, clean and excellent way to see this amazing countryside. Planning a trip to Europe can be fun and exciting. It can also be a headache. Avoid the headaches by planning well in advance of your trip. But, even with the best planning, some surprises will arise – as they always do. Here are eight pre-trip tips that can help with planning your successful exploration. No one wants the embarrassment or headache of having his or her credit card declined while traveling in Europe. If you use a credit or debit card in Europe the transaction might register as a ‘possible fraudulent event’ and the transaction will be declined – leaving you in a tight spot. Prior to your trip inform your credit/debit card company that you will be traveling overseas. Inform them of what countries you will be traveling to and a timeframe. They will update your account so if a transaction ‘flag’ appears they can see that you are traveling and approve the transaction. In the event your credit card is stolen or lost how will you contact the bank or card company? As a backup measure have the customer service phone numbers recorded in a separate location. I also write the last four digits (not all of the numbers, just the last four numbers) of the card along with the phone numbers to help identify my account. No one likes seeing unexpected fees on their monthly credit/debit card statement. Prior to your trip contact your credit card/debit card company and inquire about the currency exchange rate fees. The fees can run about 3% of the total transaction. Ouch! Knowing this amount will help with planning how you use your money on your trip. Having a friend or family member collect your mail can be the best peace of mind while you are traveling. If this is not an option, submit a request with the Post Office to hold your mail prior to your trip. This can be done online and they can hold your mail for up to 30 days. At the time of this writing only a physical address, not a PO Box, can be requested online. A PO Box request must be made in person at the local post office. Do this several weeks before your trip just so it is out of the way. This is an actual quote from my bank. Even if your bank is located in the middle of an economic powerhouse, like Silicon Valley, do not assume your bank can easily obtain the Euros or the currency you need in a weeks time. Exchange any money you need several weeks prior to your trip so your bank has the time to process the request. Interesting though, my bank charges a hefty fee, which happens to be roughly the same fee the money exchange station at the airport charges. Most taxi services are professional, but some are not. I have been stuck waiting for taxis that never arrive, or are horribly late. When departing for the airport a shuttle or private car might be the better deal. Shuttles are inexpensive and work well for departing flights, just allow time in your itinerary to make several other stops along the route to pick up other travelers. Private cars are expensive if one person is traveling, but if you have several family members a private car can be the same or about 20% more than a shuttle. The advantage of a is that a private car goes directly to the airport saving time, and the drivers usually treat their riders like human beings rather than a piece of livestock. For trips from the airport, I am personally not fond of shuttles, a taxi or private car might work better. After a long trip of being on an airplane, not eating right or sleeping well I just want to get home. The last thing I want to do is to prolong a 12+ hour flight by sitting for another hour in a cramped and bumpy van, at rush hour, where I am the final stop, only to save a few dollars. Several weeks prior to your trip ask a friend if they can pick you up or drop you off at the airport. If not, look at the taxi, shuttle, private-car options. The key is to plan your ride several weeks out. It is always good to hear from and see family and friends, but several hours before your trip as your packing and dealing with loose ends is not a great time. This might sound unsavory but, it is OK to tell folks that you are leaving a day earlier than you actually are. Be careful what you post on social media sights too, and make yourself invisible on Skype and other online services. You don’t want to be slammed by well-wishers as you are packing and tying up loose ends. While best wishes are appreciated, the day before a trip is your private time to deal with little things so they do not become big problems and ruin your trip. Being billed again for something you paid for will wreck a budget. Just because something, like a hotel, is booked and paid for online does not mean you won’t get billed again. Prior to your trip print a receipt showing that a bill was paid for in advance. Then on your trip, look at the hotel receipt and confirm you were not double billed. Clutter prevents people from traveling and experiencing life. These innocent looking piles of paperwork, a messy garage and boxes of stuff are always cluttering up households. For the person who wants to travel, explore and see more of the world clutter zaps resources; it eats up time, consumes money, it lives in our homes rent free, and haunts us in the back of our mind, as something to work on. Clutter stops Explorers like Kryptonite stops Superman – clutter impedes movement. The single most effective thing to do in battling clutter is to make a budget. Why? A budget forces a person to look at their money and think about their household expenses. Thinking about these expenses and seeing how they are used influences what is bought , where you shop and most importantly, what is allowed into the house. Invest in a basic money management software program for the computer; it will quickly pay for itself. Clutter costs money. Just because stuff is sitting around does not mean it is not costing you. Clutter takes up space in your home, it is always there as a ‘to do’ in your mind, it is there when you leave for work, it is there when you come home. You are working but the clutter is not. Deal with the clutter by attaching a monetary amount to it: for big items $10, medium sized items $5 and for small stuff $1. This is the ‘rent’ I charge the clutter for being in my house. Add it up, whoa! Then multiply that by 12 months. Holy cow! This is the dollar amount the clutter is costing in terms of physical space and costs to mentally manage the stuff. How long has that box of stuff been sitting around? Date it. It is amazing how long things sit around and are never dealt with. Adding a date gives you a time reference. As a rule, if it is over a year old and you have never needed it, get rid of it. Junk mail is a daily in-source of clutter in the household. Get rid of it immediately. Arm yourself with a shredder and have a field day grinding the clutter into recycling materials. Several sites are online to remove your self from mailing lists; however this task should be done every several months. The 80/20 rule (the Pareto effect) states “for many events, roughly 80% of the effects come from 20% of the causes.” Identify that 20% that just sits around and causes 80% of the problems. It is likely clutter. The problem with storage containers is that they are designed to store stuff. It is easy just to buy a container and stuff the clutter into it. If you have a bunch of storage containers put a date on them as was mentioned above. After a year give them the 80 / 20 test and rid yourself of a good number of items. Keep that TV turned off. TV is a form of mental clutter and gobbles up your time and keeps you from dealing with all of the other clutter. Use TV sparingly. 8. Have a BIG Garage Sale. When you’re ready to get rid of the clutter do a personal cost/benefit analysis on your time. Is it better to give a bunch of stuff to a help-up organization (like Goodwill) or to have a good old-fashioned garage sale? The end result is the same you get rid of stuff. On your calendar set dates to deal with different projects, like the closet, that box of stuff, the second box of stuff, the cabinet, that kitchen drawer with all the stuff, etc. Close the loop on clutter by embracing frugality. Being frugal is not about being miserly or cheap or doing without; it is about using resources wisely, being economical and minimizing waste. Shop for items by how they impact your budget and how they help you reach your goals. Dealing with clutter is not about simply cleaning stuff up, it is a long-term process of changing your life so you can do more of what you want to do – like traveling, exploring and seeing more of the world. Keeping a budget is always a great idea when you’re traveling, but when the dollar is weak a budget is an absolute. Stay within your designated daily spend amount; if you have to go over your daily budget make sure you can reign in the costs elsewhere. Keep your receipts and at the end of the day add them up – it only takes five minutes, but it gives you peace-of-mind knowing about your money. Even if you use a credit card, keep your receipts and avoid the temptation of splurging on credit. As a reward for keeping a budget give yourself a well-deserved splurge toward the end of your trip. When booking a flight to Europe research your primary destination and surrounding airports. Sometimes it is more affordable to fly into a neighboring airport, stay one night and catch a train to where you want to go. Plus you have the benefits of a side trip. I saved, on an upcoming trip to Austria, $400 on my ticket flying into a neighboring airport. Even with the costs of accommodation and a train ticket, the total cost is still less than if I had flown into the original airport – plus there is the added bonus of anticipating a four-hour train ride through the stunningly beautiful and magnificent Alps. Major cities are often black holes for the budget minded traveler. Sometimes you have to be in the center of the action to see the sights, but consider balancing a city visit with staying a little further out and catching a train, a bus or walking into town. Sometimes you just have to play the part of being a tourist to see all the sights and visit all of the museums. However, playing the part of a tourist can be costly and add up quickly. Look for a multi-day pass often sold at tourist information centers provided by the city. With such a pass you pay a flat rate upfront and can see as many museums over a several day time frame that your heart can indulge. Usually included in the pass is bus fair for several of those days. When you eat out, plan to eat many of your meals at small café’s or restaurants where the wait staff greets you in his/her native language. One of the best tasting and affordable meals I ever enjoyed was in Italy at a tiny, family-run restaurant in a small village near Lago de Bolsena (Bolsena Lake) several hours north of Rome. The restaurant clung to the side of a steep hillside overlooking the blue lake. No one in the restaurant spoke English and the menu was entirely in Italian. Because we were in a little village far away from a major city the prices on the menu were not for tourists, but rather priced for locals. The owner of the restaurant was grateful for the additional business and enjoyed seeing new faces. The entire experience lasted several hours and it offered the opportunity to ‘talk’ to the locals using a combination of broken English, Italian and a number of hand signals; the food, wine, and experience was unforgettable. Contrast this with a visit to a major city in a touristy area. In this particular case, it was Florence, Italy – a beautiful and historic city – but very expensive. Many of the restaurants near the historic museum’s areas offer menus in English. I have found that waiters often greeted me in English and charge higher prices because I am a tourist. The food can be lackluster and the experience rushed. At one restaurant the waiter greeted me in German (thinking I was German); when he learned I was American he quickly, and with a graceful slight of the hand, replaced my menu with one written in American English. It was an odd experience. This is just one example, but the lessons are the same elsewhere; save money and meet the locals by trying to eat where the native language is spoken – the food will have much more local flair and flavor. Carefully planning how you spend your money, especially when the dollar is weak, can help keep money in your pocket. It also allows you to step away from the touristy areas and see how the locals live and carry about their daily lives – which always provides a rich experience. Want to Travel, Explore and See New Places? Turn Off the TV. People often think that being a parent, having a home, and working a full-time job prevents them from traveling, exploring or spending more quality time with family. As a full-time worker, and a Dad who has to pay bills I understand these are responsibilities that often require Herculean efforts to manage. So, with such little time remaining in a personal schedule what can a person do? That is over 5 hours a day of TV! Now, consider the average TV show has 8 minutes of commercials for every 22 minutes of programming – when the TV is on for five hours a day the viewer is exposed to 80 minutes of just advertisements a day! Yuk. For years I blamed multiple factors because my weekends had disappeared with housework, my vacation time-off was non-existent and that I could no longer travel, explore and do what I really wanted to do. As I looked at how I used my time I realized the TV consumed several hours a day. When I added it up I was surprised; by turning off the TV I reclaimed 20 hours a week. Time I use on things that are fulfilling like thinking about the weekend, researching a local place to hike or even planning about how I can budget an overseas trip. Do I watch some TV shows? Yes, a select few, because sometimes you have to relax after a long day. But I watch the TV on my schedule, by watching either delayed shows via a recording device or by purchasing a select few episodes online. By controlling what I watch the TV is not controlling me, or my time. Folks who write in asking how they can travel, explore and see new places are given the same suggestion – a good start is to turn off the TV. The Sanborn Park Hostel is a beautiful historic log house hidden among the coastal redwoods of Sanborn Park County Park near Saratoga, California. Sadly, after a 30-year run, the hostel recently closed its doors. Shown above is how it appeared at the time of the closing in 2010. Below is how it appeared in its heyday – in the late 1980s and early 90s. 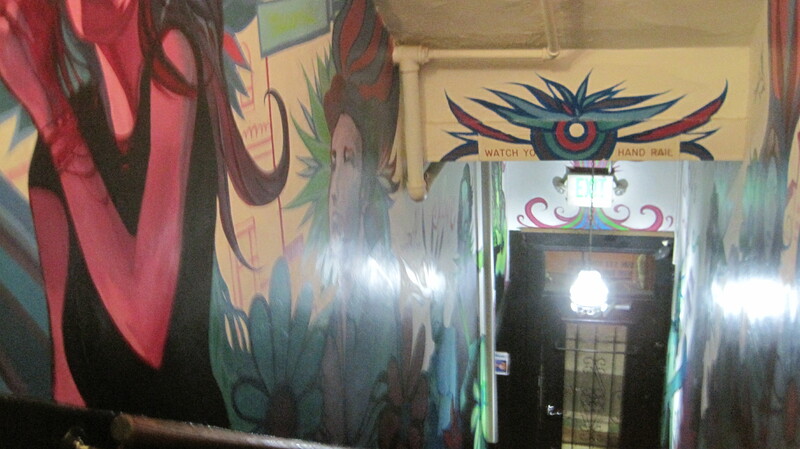 Sanborn Park Hostel – a view from its heyday in the late 1980s and early ’90s. 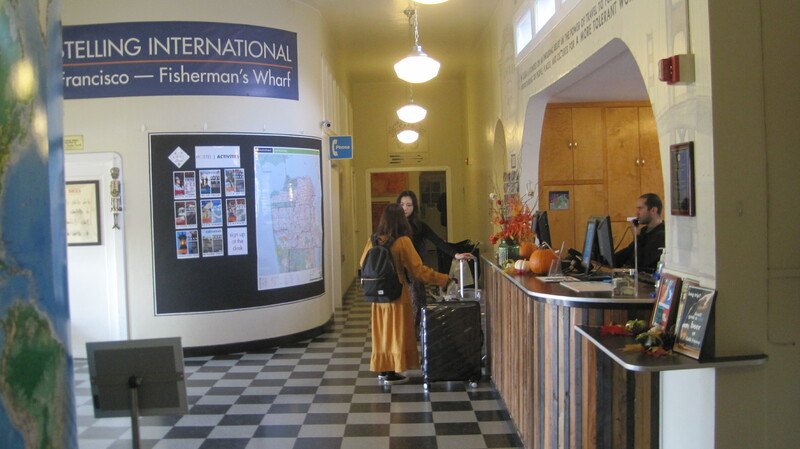 This hostel was a friendly place to stay for backpackers, international travelers, bicyclists, Scout troops, church groups, students on field trips and families who needed a weekend away from the frantic pace of Silicon Valley. Visitors could explore miles of trails in the 3,688-acre park, discover a nearby section of the San Andreas Fault, enjoy a short hike to a Nature Center, take a picnic to a nearby winery or enjoy a cookout under a grove of redwood trees. The Hostel always provided programs and trips to help ‘tell the story’ of the local area for those who were curious. 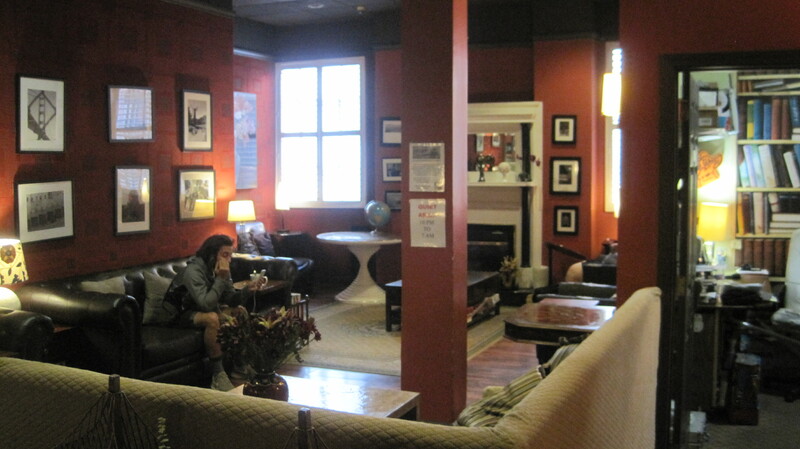 Like the park and the redwoods around the building, the hostel also has a story. For hundreds of years, the local area was visited by native Ohlone people. Signs of their acorn grinding mortors can be found on monolithic rocks that now form an entry to Hostel grounds. The Grizzly Bear once lived in this park. Forests of old growth redwood trees blanketed the hillsides; several large redwood stumps eight feet in diameter are still in the woods if you know where to look. In 1908 the Honorable Judge Welch built a large log style summer cottage. He named it, “Welch-Hurst.” The name was derived from his name and the word Hurst, meaning woods or a grove. The Judge planted several orchards in the area. He also had a vineyard. He turned a nearby sag pond (sag ponds are natural pools found along the path of the San Andreas Fault) into a picturesque pond with a small island, footbridge, waterfalls, and large lily pads. The pond was home to fish, frogs and an assortment of ducks and geese. In the 1950s a man named Pick lived in the log style house. Mr. Pick had discovered Uranium in the west (Wyoming or Colorado) and sold his claim to the U.S. military earning several million dollars at the time. With part of his fortune, he bought “Welch-Hurst” and he renamed it “Walden West.” The name was derived from the book, “Walden,” by author, philosopher, and naturalist, Henry David Thoreau. Pick added a number of buildings in the area including a small complex of buildings that housed early IBM employees and possibly helped to incubate some thinking that led to modern Silicon Valley. Today, the buildings of Walden West provide outdoor education programs for students. In the 1960s and 70s, the house rapidly passed between several owners and the structure was in serious decline. 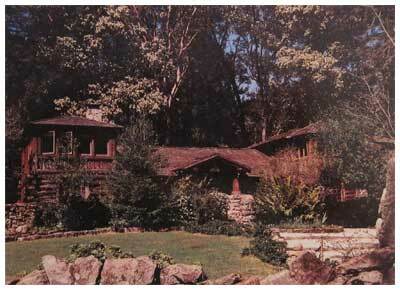 In 1970s Sanborn Park was being expanded and the old house was purchased by Santa Clara County. Estimates at the time to renovate the deteriorating Welch-Hurst house was estimated at half-a-million dollars, too much for county coffers, and the house was scheduled for demolition. 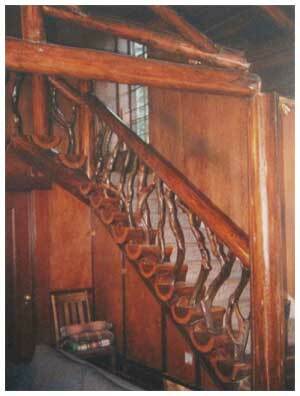 Sanborn Park Hostel’s Madrone and Redwood Staircase. In 1979, as destruction seemed imminent, the volunteers of the Santa Clara Valley hostelling club stepped forward with a box of hand tools and $460 in the bank to finance their reconstruction project. They were given the go-ahead. Year-after-year volunteers completely rebuilt and refurbished the Judge’s old home. In the main house, they preserved the original rock fireplace and the beautiful madrone and redwood staircase (shown). They also reconstructed the old carriage house turning it into a modern building with beautiful pine ceilings and wooden floors – all the time using as much wood from the original structure as possible. Tax dollars were never used to restore Hostel. This effort was entirely self-funded. The hostel’s ‘Golden Age’ was in the late 1980s and the early 1990’s when the Hostel’s 39 beds were completely booked. After the horrible events of 9/11 in 2001 international travel plummeted. Seeing a backpacker from Europe was a rare sight. American travel also declined during this time as a strained U.S. economy, lessening vacation time for families, increasing insurance costs and a host of other reasons impacted travel and the Hostel. These forces slowly took their toll and Sanborn Park Hostel closed in 2010. When the hostel closed the price to stay for one person was $14, the lowest overnight fee at any hostel in the United States. The County has no plans for the historic Welch-Hurst building which the Hostel rented from the Parks Department. The refurbished one-hundred-year-old house will likely be boarded up and forgotten. The building is on the Registry of National Historic Places. I have many fond memories of the hostel. While in college I worked as a ‘Houseparent’ at Sanborn Park Hostel. At the time I wanted to travel, but could not; working at the Hostel provided an opportunity for the travelers to come to me. The Hostel provided me with rich opportunities to learn about different cultures and to meet a wide variety of people. During this time I met thousands of people and some special travelers from Australia, New Zealand, and Austria became life-long friends. One wonderful woman traveling from overseas eventually became my wife. At times the hostel had a ‘magic.’ One such time involved an evening sitting in front of the large stone fireplace in the living room. A small but bright fire burned. About fifteen people, of all ages, some from overseas, sat on the sofas. We talked about the world. At one point someone brought out some sweet crackers, then someone else made tea for the group. We all talked late into the evening about ideas, places to travel and shared stories. It was an evening that fed the soul. This might sound odd, but if you find yourself in such a setting ask how people sing ‘Happy Birthday’ in their native language. It is a great way to make friends and end an evening with a smile. In the 30 years as a Hostel, 157,460 people stayed as overnight guests. This number included visitors from 99 foreign countries and all 50 states. Foreign travelers accounted for 20 percent of the total visitorship; that is roughly 31,500 visitors who chose to explore and experience America. 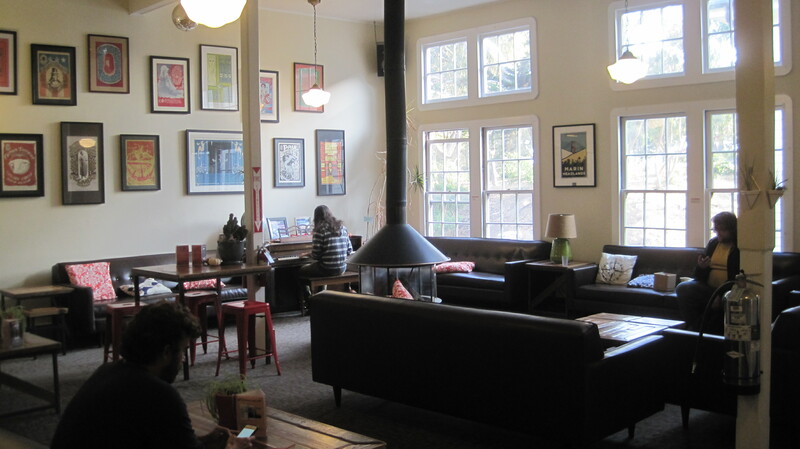 Four points are especially noteworthy about Sanborn Park Hostel’s 30+ year run. The work to refurbish this historic 100-year-old building was done entirely by volunteers. Not one penny of public money was ever used to refurbish or operate the building – it was entirely self-funded. During the hostel’s entire history, it had the lowest overnight fee of all US hostels, only $3 in 1979 to $14 when it closed. In the 30 years of being a Hostel that 157,460 overnight visitors stayed here; with visitors from 99 foreign countries and all 50 states. The organization who started Sanborn Park Hostel will continue their famous monthly pot-luck and slide show dinners on the last Thursday of the month at the Saratoga Community Center. 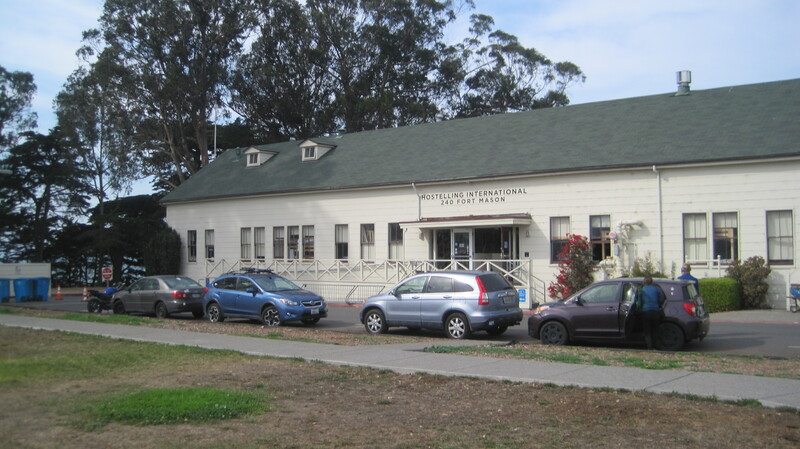 Plus, some of the resources from Sanborn Park Hostel have been used to further Hostelling along California’s Central Coast. So in a sense, although the Hostel is gone it will continue in spirit.